Many strategists adore how Apple has closed off their ecosystem from others and did everything on their own. They don’t miss to point out that this was the key to dominating the smartphone market. But there is another huge player that dominates the smartphone market (maybe in less obvious ways): Google. And interestingly, their strategic IP management strategy was the exact opposite of Apple’s strategic IP management approach. Without ever manufacturing a single phone themselves, Google has managed to get their Android OS on over 1.3 billion smartphones, 85% of all smartphones globally. Such achievements are not possible without brilliant IP strategies. Oct 2003: Android, Inc. was founded by Andy Rubin (et. al.) aiming to develop a better operating system (OS) for digital cameras. Later pivot to smartphones OS to compete with Symbian and Windows Mobile (the iPhone did not exist at this time). July 2005: Google acquires Android (for assumed $50m). Speculation that Google would enter the phone market. 9 Jan 2007: Apple iPhone 1G announced and introduced on 29 June 2007 (running Apple’s iOS). 5 Nov 2007: Open Handset Alliance inaugurated comprising 34 founding members from Network operators, software developers, component manufacturers, device manufacturers and others. The goal is to develop open standards for mobile devices. Android is being announced as a product on this day. 22 Oct 2008: First handset using Android released: HTC Dream. Jan 2010: Google Nexus: smartphones, tablets, digital media players designed by Google but manufactured by OEMs (LG, HTC, Samsung, Motorola, Asus). Nexus One released in Jan 2010. April 2015: European Commission accuses Google of anti-competitive behaviour in relation to Android OS. Oct 2016: Google Pixel smartphones announced. With this, the Nexus line is not discontinued but also no commitment to continue. Google has acquired Android in 2005. Business Insider reports that Google saw a Microsoft monopoly on the mobile market as a major threat. At this time Apple’s iPhone was nowhere on the horizon, even though being speculated about. The threat that someone monopolises the mobile phone market, however, was real. And with the wisdom of hindsight, it was possibly an even larger threat than anticipated. In 2016 more than 50% of internet searches come from mobile devices. Missing out on a large percentage of those would directly impact Google’s top line but also give them a blindspot on what people are searching for while mobile. It would also limit many of Google’s location-based functionality. Google Maps is not half as useful on a desktop than a mobile. Google seems to have anticipated this. The best indicator are their multiple acquisitions of start-ups in early 2005 that in the following years have lead to products like Google Maps, Google Earth, traffic functionality, etc. 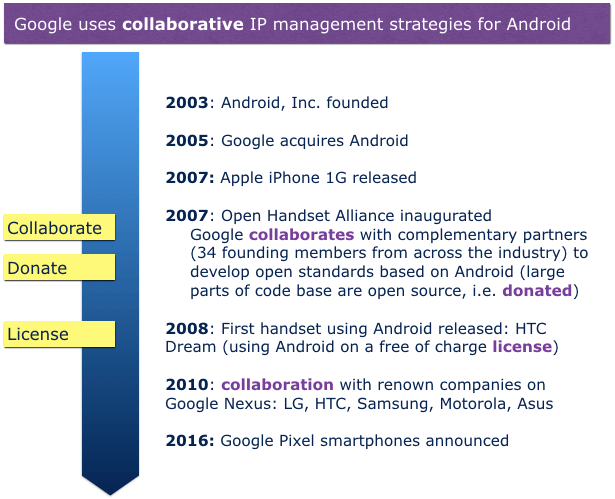 One of the most important moves that Google made was to work towards establishing the Open Handset Alliance (OHA). And they were leading these efforts. The alliance assembled important partners in the mobile world whose aim is to develop open standards for mobile devices. The alliance was announced on 5 November 2007 and at that event, Android was announced as their key product. This was 5 months after the iPhone 1G was introduced (and 10 months after it was officially announced). Strategically, a monopoly of Microsoft (or any company for that matter) on the mobile phone market could hurt Google in that it gives the owner of the platform (the mobile and the OS) the power to direct people by default to a different search engine than Google.com. Google’s search engine was and is the generator of 95% of their revenue. Google stayed away from manufacturing hardware themselves, an area where they were not strong. But they do need hardware to bring their IP (the operating system) into the tangible world. Thus, they reduced their risk of technical and financial failure. They learned from these endeavours to make their OS more relevant and better integrated with the hardware. And they learned about designing and developing hardware. Knowledge, that they have built on in manufacturing their own phones, the Google Pixel. They followed a partnership approach with other members of the alliance and demonstrated they are *truly* willing to cooperate. This is a trait that others on the market – *cough* Apple, *cough* Microsoft – are not exactly known for. I have pointed out the importance of these three elements in our article about the IP Business model. ARM Ltd has been a master of this. Their chip design has been manufactured 30 billion times in smartphone components without ARM having ever manufactured a single chip themselves. This article also showed many similarities to Google’s IP management. Google has donated their Android OS to the members of the alliance but also to anyone else who wanted to use it and this comes at no licensing costs. The explosive growth of Android has been fuelled in large part by this decision. This is the global chart. It shows well how the other OS decline rapidly. 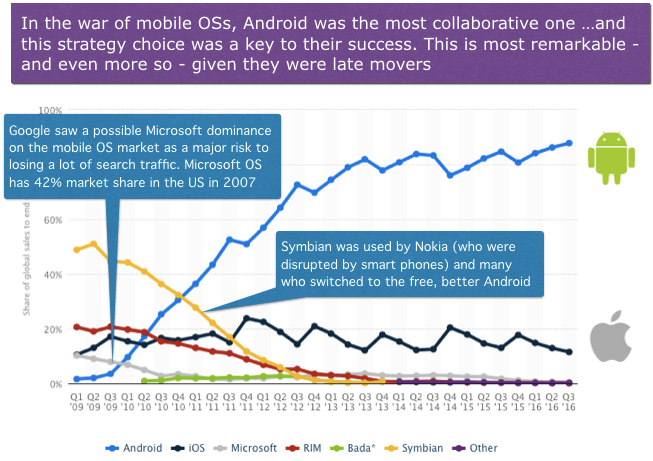 Symbian, the most widely spread mobile OS in 2009 was used by many manufacturers, such as Motorola, Samsung and mainly Nokia who were the biggest phone manufacturers. 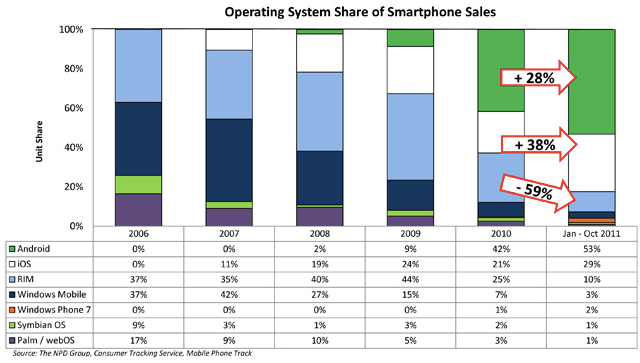 Symbian’s decline is explained by some manufacturers switching (some were part of the OHA, e.g. Samsung) to Android and the rapidly declines sales of Nokia. RIM (Research in Motion – the Blackberry company) had their own OS. And with the death of Blackberry, the OS also gets eliminated. I have seen a number of articles in my research that didn’t take Google’s concerns over a Microsoft dominance of the phone OS market very serious. In hindsight, it may appear like that. But there is also another possible interpretation. And that is the brilliance of Google’s Android strategy. Maybe it was so successful that it prevented Microsofts Mobile OS regaining momentum as Nokia (and with it possibly Symbian) and Blackberry were declining. We will never know the counterfactual but it is possible. Microsoft can’t have liked being forced out of this market. And after all these years, they now have relaunched. They have integrated mobile OS into their Windows 10 Mobile. The demise of RIM’s OS demonstrates another point. The dependency to the handset didn’t bode well for it. Yes, it was built to work on RIM’s own hardware, the Blackberry. But the point is still valid. Because it demonstrates another point that Google did right. Android is scalable to the capabilities of the handset. Those handsets with large memory, processors and screen can use more of Android’s functions. And the smaller ones only use the code they need. This avoids getting bloated by code they don’t use – a problem so well known, that we don’t even question it anymore and have accepted under the term “minimum system requirements”. Google gives away Android for free but not without a licence. And this is the third significant pillar of their Android IP management strategy. To understand this, I have to give you a few more acronyms. Android Open Source Project (AOSP): this is the core of the Android OS. Its code is open source and can be used by any company to further build on or to use as-is (let’s say with minor adaptations). Many companies, especially in China, use this code base at least as a starting point. But it does not have some of the advanced functionality. 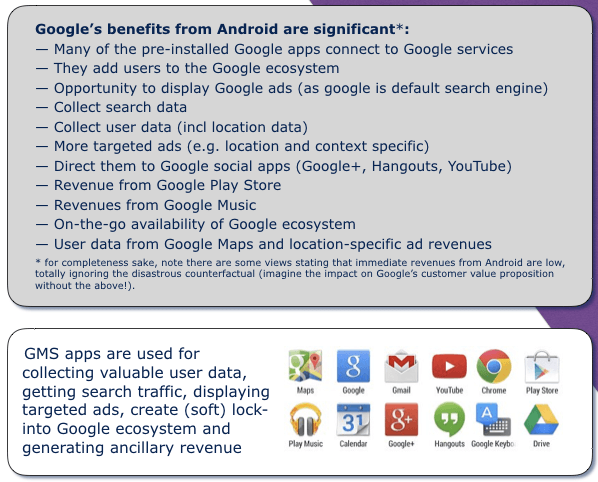 Google Mobile Services (GMS): These are more sophisticated functions of the Android OS. Any company that wants to use these, needs to sign up to Google’s licensing. Search: the AOSP version of search is stuck in a very early Android version while the GMS version has been further developed with voice search, text-to-speech, etc. Music: again, the AOSP version has not been further developed while the GMS version has connectivity Google Play Music and enhanced functions. Calendar, keyboard, camera, messaging: similarly stuck in early versions while the GMS version has received enhancements. Advanced location features, in-game payments and other features do not exist or exist only as rudimentary functions in the AOSP. This list is growing. And with more recent versions of Android, we are back to the “minimum system requirements”. A comparison of Apple’s iOS with Android shows that Android users run on average significantly older versions. Not all is Android’s fault. But at least to a certain degree, this occurs, because newer versions of Android, require more advanced hardware than users have. 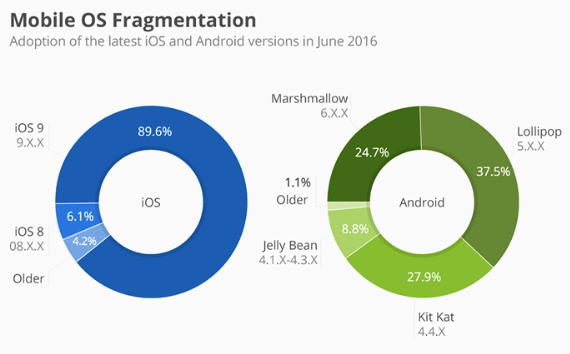 Mobile OS fragmentation in 2016. Android users are several versions behind (for many reasons). 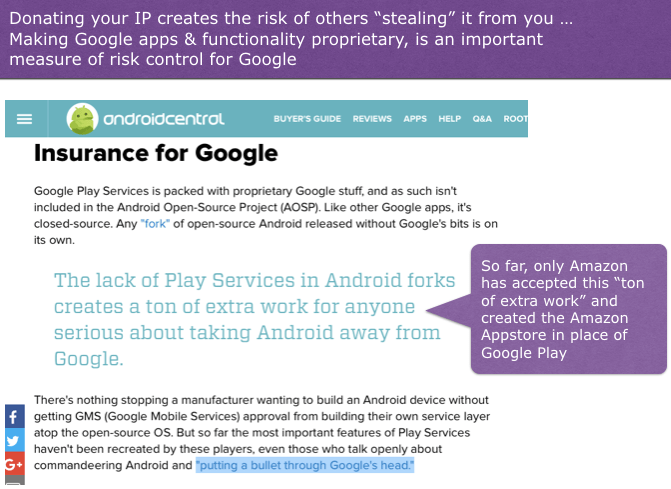 Google uses proprietary IP strategies (mainly trade secrets) to protect their IP. Yes, you may say that companies can just license the GMS and provide for the latest hardware and all is good. But I have pointed out that even “free” licensing may come at a cost. It gives Google a lot of power over a large portion of the 85% smartphones that Android counts as their install base (it is around 50% that use the GMS over which Google can exert more power). There are good points being made that Google would not be able to provide a consistent Android customer experience if it did not have a strong grip over its functions and the process by which it gets put onto the customer phones (this applies to GMS, of course). 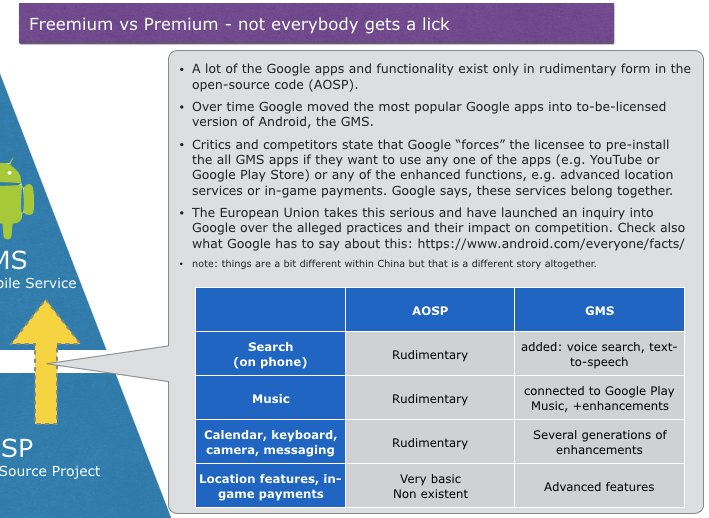 Did Google force or incentivise Android phone and tablet makers to “exclusively pre-install Google’s own applications or services”? Did Google prevent smartphone and tablet makers who wanted to install Google applications and services on some devices from shipping “modified and potentially competing versions of Android (known as ‘Android forks’) on other devices”? For completeness sake, note there are some views stating that immediate revenues from Android are low, totally ignoring the disastrous counterfactual – imagine the impact on Google’s customer value proposition without the above! Google’s strategy to keep global search traffic within their systems worked brilliantly well so far. But new challenges are emerging with Facebook, Snapchat, Siri, Amazon Echo and many other players forming. We can look forward to observing more instructive strategic battles on this front. Android also follows a platform business model and is a development platform. I have described different types of platform businesses here. 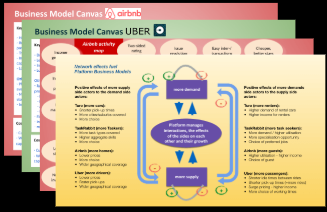 And the platform business model extensively here. The article today focussed on the IP management aspects of Android. I have found Google’s mastery on managing intellectual property highly insightful.